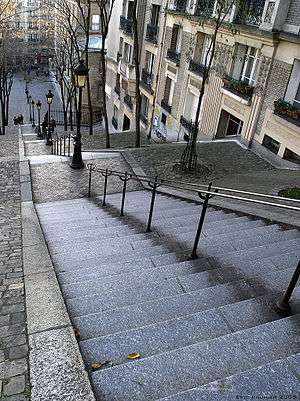 Montmartre (French pronunciation: ​[mɔ̃.maʁtʁ]) is a large hill in Paris's 18th arrondissement. It is 130 metres (430 feet) high and gives its name to the surrounding district, part of the Right Bank in the northern section of the city. 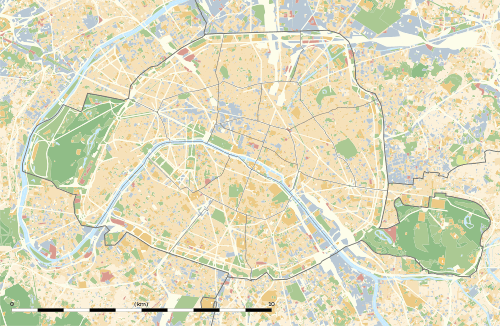 The historic district established by the City of Paris in 1995 is bordered by rue Caulaincourt and rue Custine on the north; rue de Clignancourt on the east; boulevard de Clichy and boulevard de Rochechouart to the south. containing sixty hectares. 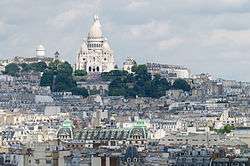 Montmartre is primarily known for the white-domed Basilica of the Sacré-Cœur on its summit and as a nightclub district. 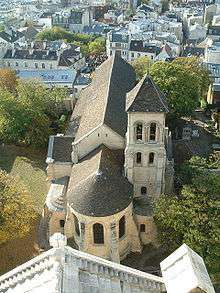 The other, older, church on the hill is Saint Pierre de Montmartre, which claims to be the location at which the Jesuit order of priests was founded. The toponym Mons Martis, Latin for "Mount of Mars", survived into Merovingian times, gallicised as Montmartre, signifying "mountain of the martyr"; it owes this name to the martyrdom of Saint Denis, who was decapitated on the hill around 250 AD. Denis was the Bishop of Paris and is now known as Saint Denis, patron saint of the Kingdom of France, one of the secondary saint patrons of France. 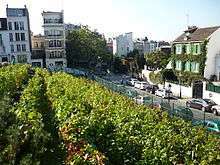 Archaeological excavations show that the heights of Montmartre were occupied from at least Gallo-Roman times. Texts from the 8th century cite the name of mons Mercori (Mount Mercury), and a 9th-century text speaks of Mount Mars. Excavations in 1975 north of the Church of Saint-Pierre found coins from the 3rd century and the remains of a major wall. Earlier excavations in the 17th century at the Fontaine-du-But (2 rue Pierre-Dac) found vestiges of Roman baths from the 2nd century. 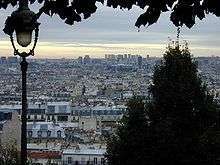 In 1790, Montmartre was located just outside the limits of Paris. 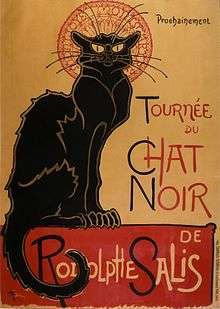 That year, under the revolutionary government of the National Constituent Assembly, it became the commune of Montmartre, with its town hall located on place du Tertre, site of the former abbey. The main businesses of the commune were wine making, stone quarries and gypsum mines. 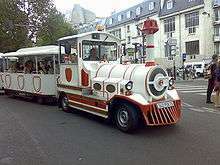 (See Mines of Paris). The mining of gypsum had begun in the Gallo-Roman period, first in open air mines and then underground, and continued until 1860. The gypsum was cut into blocks, baked, then ground and put into sacks. Sold as 'montmartarite, it was used for plaster, because of its resistance to fire and water. Between the 7th and 9th centuries, most of the sarcophagi found in ancient sites were made of molded gypsum. In modern times, the mining was done with explosives, which riddled the ground under the butte with tunnels, making the ground very unstable and difficult to build upon. The construction of the Basilica of Sacré-Cœur required making a special foundation that went forty meter under the ground to hold the structure in place. A fossil tooth found in one of these mines was identified by Georges Cuvier as an extinct equine, which he dubbed Palaeotherium, the "ancient animal". His sketch of the entire animal in 1825 was matched by a skeleton discovered later. 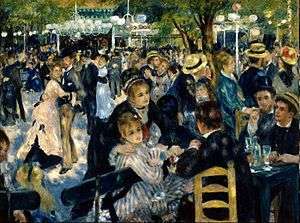 In 1871, Montmartre was the site of beginning of the revolutionary uprising of the Paris Commune. During the Franco-Prussian War, the French army had stored a large number of cannon in a park at the top of the hill, near where the Basilica is today. On 18 March 1871, the soldiers from the French Army tried to remove the cannon from the hilltop. They were blocked by members of the politically-radicalised Paris National Guard, who captured and then killed two French army generals, and installed a revolutionary government that lasted two months. 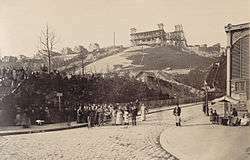 The heights of Montmartre were retaken by the French Army with heavy fighting at the end of May 1871, during what became known as "Bloody Week". The Great Race (1965), shows Professor Fate in the "Hannibal 8" driving down the Basilica steps after a wrong turn while racing to the Eiffel tower. 1 2 3 4 5 6 Dictionnaire historique de Paris, p. 477.